Has everyone heard about Malcolm Gladwell's new book? It's called Outliers: The Story of Success. The dress above is something I would love, someday, to be able to make. (It's the Charles James Butterfly dress, from the Chicago History Museum.) Let's assume, whether it's true or not, that I don't have to be a staggering 10K-hour rocket scientist to make it, but could skate by on merely 8K hours of practice. How far am I from being able to make this dress? I've probably sewn an average of 15 hours a month for the past twenty-five years, sometimes a little more, and sometimes a lot less. But let's take 15 hours a month as average. 15 x 12 x 25 is 4,500 hours, putting me just above mediocre … which, to be honest, is right where I would say my own sewing skillset is (and those of you who keep pointing out — rightly — that I should match my patterns better will agree!). But if I keep sewing at this rate, or, better yet, crank it up a bit more, I could be at Charles James Dress Level in another decade or so — which certainly worth trying for, right? TEN THOUSAND HOURS may sound a bit frightening, but to me (since I'm almost halfway there!) it sounds fantastically encouraging. To hear that I don't have to have some ineffable pixie-dust sprinkle of magic called talent or genius or knack to make the kinds of dresses I dream of — all I have to do is KEEP AT IT? And that this notion is backed by Science? How great is that? I'm also going to be more generous from now on in what I call "practice." Reading sewing blogs & magazines and seeing new techniques? Practice. Hanging out in the fabric store? Practice. Idly googling "Callot Soeurs"? Practice. These next 5,500 hours are going to FLY by, I tell you! So … what do you want to be great at? How fast can you get to 10,000 hours? I'll wait while you do the math. I love this post! It really spoke to me. Right now I am trying to decide what to do with my life because the economy is forcing me out of a comfortable job and into an uncomfortable, unknown area. I was second guessing myself, but this post made me realize I can do it. All my mistkaes, I mean practice, means I can do it. Thank you, Erin! Thank you so much Erin for this post and for the link to the article! So let’s see… I’ve got in about 30 hours of belly dancing up to now, and I’m coming up on 62 (years old). If I take early retirement and really put my mind to it, I could be a world-class belly dancer by the time I’m 70! Or I could just continue to puddle along in Beginner 1 class (OK, maybe Beginner 2, eventually) and have fun! But I’m really glad that the Beatles were a little more dedicated than I.
What’s weird is that just as I was reading your post the author came on The Colbert Report in rerun to talk about the book. Freaky. Wow, I am a world-class champion novel-reader. That’ll put a spring in my step today. What an encouraging, optimistic take on skill. So let’s see, I’ve probably sung for at least 2 hours per week for the past 31 years … crap. No wonder I’m not a rock star. YET. I worked for 15 years at a bank and was laid off. When I was laid off I was excited because it was my determination to take my sewing skills and make them better. It is 5 years later and it is still my determination. I have made bridesmaids dresses and 3 prom dress and 2 graduation dresses and I have no photographs of any of these accomplishments. ( I recently purchased a camera ) I have periods when I just stop sewing (i mean not even a button) I have periods when I cannot be stopped. ( my husband actualy flipped the breaker switch so I thought it there was a power outage. I just finish by hand. )I want to improve on every aspect of creating beautiful dresses. I started sewing at 15. I am now 46 so that is 27 years. I will work toward the 10,000. with great diligence in the next three years and I will get back to ya!Thanks for the inspiration! I started sewing my own clothes as a kid. That dress wouldn’t be that hard to make. If you can look at it closely, you can make it. If you have it on a mannequin in your studio, even better. Be sure to count the “visioning” hours you spend when you’re asleep and dreaming! They add up!This does remind me of one of the only bumper-sticker-slogan-psychology-blurbs I ever saw that I really agreed with; “Whatever we focus on, increases.”Meaning, if we focus on being scared worrywarts, that sense of unease is going to increase because that’s what we’re putting our time into. If you focus on the spirit of forgiveness, the ability to forgive others will increase. If you focus on writing 3 pages of a novel a day, that stack of papers WILL increase. So while it seems kind of simplistic and obvious, I try to remember this, and it helps me get out of a rut sometimes when I’m dwelling on stuff that ultimately doesn’t help anyone. 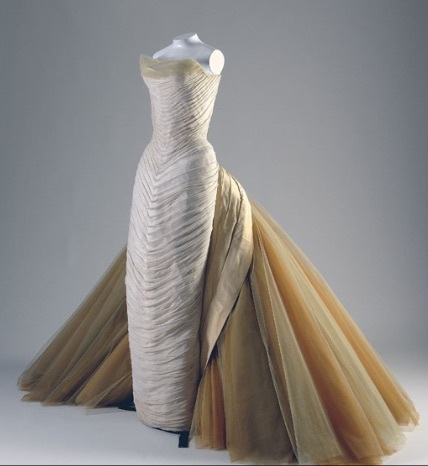 I saw the inside of some Charles James dresses once at the Brighton Museum on a Costume Society day. There was some very poor stitching in there, I can tell you – some of the older ladies in the group were positively shocked. I gather he used to get his mother (I think?) and various other random people to sew for him. I was quite pleased because it means you can make something fabulous without necessarily having top-notch skills, which is important while you’re racking up your 10,000 hours I think! So that means that if my husband and I sit down every night for an hour to work on our relationship, in about 27 years it will be perfect! XDI have no way of doing this math for the things I have already been practicing. My only-recently-diagnosed ADHD means I’ve spent my entire life with no sense of time, so unless I am actually keeping a project diary (which I usually forget to do) I have no idea how long I spend on anything. Wow, I’ve been at my career for about 28,000 hours. And I’m seriously considering a change, due to burnout and just plain jadedness. Does this mean that anything beyond 10,000 hours is just plateau? Because if that’s true, it’s more incentive for me to do something new! I don’t want to plateau! Swooning over this Charles James gown!Re Malcolm Gladwell’s new book, Michiko Kakutani gave it a tepid review in the NYT the other day. Surprising, as they usually love his stuff. Will go read the Guardian’s take now. you know, at deadline times (like exhibition or book deadline coming up) I’m sure I manage those 10,000 hours sewing in a week! I started writing fiction at 20, between university lectures. Coming up on 9 years now, writing every day, and still improving every day (I have a disability and have never been able to hold down a proper job, so I’m lucky to have had the opportunity to put the time in.) Interestingly, I’ve been advised independently that it it usually takes ten years of writing daily to become a published writer. As for sewing, I’m waaay down on the clock, but I managed to sew successfully with silk satin for the first time this year. My next challenge is chiffon.Erin, please write more fiction! (if you can find the time:) I love your Secret Lives of Dresses stories! There is great insight here in that persistence and indefatigable perfection of one’s skills will often, if not always, trump genius. A genius may leap to some great insight, but most of these insights will die, sowed on sterile ground, because the heads-down, get the job done, follow through to bring that insight to the market is lacking.It’s easy to imagine tucks from top to bottom, all exquisitely fitted, but doing it and making it work on a runway model is something entirely different, and the kind of thing that folks who have spent, say, 80,000 hours developing software and still find their proficiency increasing with experience can appreciate.But if you want to scale the heights, there’s no alternative to making the assault. Should you do so before you have the requisite experience? Of course not–that would just be discouraging. But when you think you can? You may just surprise yourself with what you can do, and how few people looking upon your work at a reasonable distance notice the flaws about which you’re grinding your teeth. Wow, our moms were right: Practice does make perfect. I wonder if thinking about sewing counts as time spent? I’m thinking of my knitting, a craft a craft at which I consider myself to be fairly advanced…let’s say I’ve been knitting for two hours a day every day for the past two years: that still puts me at a little less than 1,500 hours. 1,500?! According to that, it will take me another fourteen years, knitting at my current rate, to become an expert. Wild! that dress is absolutely gorgeous! my jaw dropped when i saw it and i’m still in awe! thanks for posting it! I’ve been knitting for 4 years now at a rate of (rough average) 3 hours per day which means that I’m already at 4380. Just another 5 years to go then! i think that means the only thing I am really good at is smoking, sadly. And I quit that! 🙂 Neato post. Great post, Erin!I’m think I’m an expert at taking naps. I’m only 29, but I’m sure I’ve already racked up 10,000 hours…. 3 years at 8 hours a day! I needed a calculator to do that. That is pretty impressive! When you show stuff like this on your blog… I feel like I’m on a field trip! A good one! Not the boring ones! Thanks for taking us along for the ride!I’m with you! I like to “practice” too! Too bad my nusband is getting me a dishwasher for Christmas. I was finally getting Good at it! Eventually I could’ve even challenged the dish-washing geniuses of the world! For those wishing to rack up a few hours, theres a How-To…My local fabric shop says theres a tulle shortage on at the moment. Itll be a full-on tulle crisis if too many people try this one at home Let the hording begin!Brides are advised to anchor veils snugly, travel in pairs whenever possible, and increase security at receptions. Double weddings are expected to be hit especially hard. Hi Erin! It’s Orion’s Sara. I first heard of the 10,000 hours rule in Daniel Levitan’s “This is your brain on music.” Ever since then I’ve kept an excel doc with the 10,000 number, I log every hour I actually do the activity (studying the activity doesn’t count since it’s training your brain in the action itself, different sides of the brain and muscle memory), and count down. The book has an entire chapter on expertise, saying for instance that research shows that successful people have more failures than unsuccessful people. So success also depends on whether you learn from your mistakes/failures and get up and try again; I guess the “get back on the horse” rule.I’m not sure I’m going to read Gladwell’s book though, it got such a scathing NYT review that I don’t know I could shake. I just read the Guardian article and it’s really fascinating! I’m not sure if I agree with his conclusion 100%, because, as he points out, it’s difficult to separate raw talent from a willingness to work. But it’s something to think about! I *love* the idea that successful people have more failures than unsuccessful people. Now I’m not screwing up, I’m failing my way towards success! I have a secret…I love the ukelele. And I finally got one. Then I heard an expert player, some young kid who was playing the socks off his instrument. And I said “Well, of course he’s good, probably been playing for his whole twenty years.”. Then it occurred to me that I’m 52. I probably have a good twenty years left, and I could get as good as that guy. So I better get started! Winston Churchill – “Success consists of going from failure to failure without loss of enthusiasm.”Tulle shortage explained by all those little fairy tutus you see on the web which require 12 yards for one 3 year old size. The lushious dress is only a foretaste of a brilliant post. Instead of doing the math, I’m gonna read Gladwell’s book and hope it inspires me as much as your take on it and post did. Thanks Erin! Oh boy, I’m at 10,000…but I think it’s just because I’m old. I see this in practice with my children: an 8 year old who can do a half-hearted falling down mess of a cartwheel, and a very focussed 6 year old who has progressed from a perfect cartwheel to a one-handed carthweel and front back handsprings. You know which kid practices constantly. I wish you much joy in seeking your remaining 5,500 hours. I hope I find something which will make me want to actively pursue 10,000 hours! The exhibit at the Chicago History Museum is a temporary one, called Chic Chicago. It’s a must see. We spent a couple of hours there. I am currently at work on a non-fiction book. I have never been published (except for letters to the editor and my blogs) but when I look at your calculations and consider all the writing I have done up to this point, and I see that I have already accumulated more 10,000 hours, I am very encouraged about getting my book published. For example, one year I was away and wrote home every day (this was before the days of blogs and the internet even) and amassed 300,000 words. 300 times 30 is 9000! And that was just one 12 month period. Thank you for putting this into perspective this way. More than ever, I am now looking forward to the Spring and sending out query letters.